ARTIST’S RENDERING shows Freeport Street and surrounding properties after completion of the reconstruction. Freeport will be three lanes, from I-10 to Holly Park, with curbs, sidewalks, and extensive new drainage lines. Officials, community leaders and contractors gathered last Wednesday, Nov. 6th at the Leon Grayson Center on Corpus Christi Street, for a ceremonial groundbreaking to mark the beginning of a three-year project to reconstruct Freeport Street, and the storm sewer system along the street and to either side. According to Pct. 2 Commissioner Jack Morman, this project will cost $12.8 million dollars. The money is coming from the federal government, he said, as reimbursement for flooding damage after Hurricane Ike in 2008. The money will primarily be used to build new storm drainage that will alleviate future flooding. At the same time, this gives an opportunity to reconstruct pavement along Freeport Street, resulting in a modern 3-lane road from I-10 to Holly Park Drive, with curbs and sidewalks that are not there now. 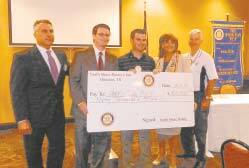 and Rotary President Matt Davis, and Chamber representatives Wilfred Broussard, Jr. and Margie Buentello. Morman said that Freeport will also get new sewers and paving from Woodforest to Uvalde, but will not be totally rebuilt in that section. However, the Cloverleaf area will receive new overlay asphalt paving on selected streets. This work is part of the Pct. 2 BetterStreets 2 Neighborhoods program that Morman is conducting throughout the precinct. Engineers for the street and sewer work are R. G. Miller Engineers, and Dannenbaum Engineering Corp. Contractor for the work is Allgood Construction Co. Inc. County Engineer is Art Storey Jr., HCCSD Director is David B. Turkel, Pct. 2 Engineer is Jeremy Phillips. Funding for the project is from the Texas General Land Office, and U.S. HUD. Completion is expected by 2016, according to Morman. 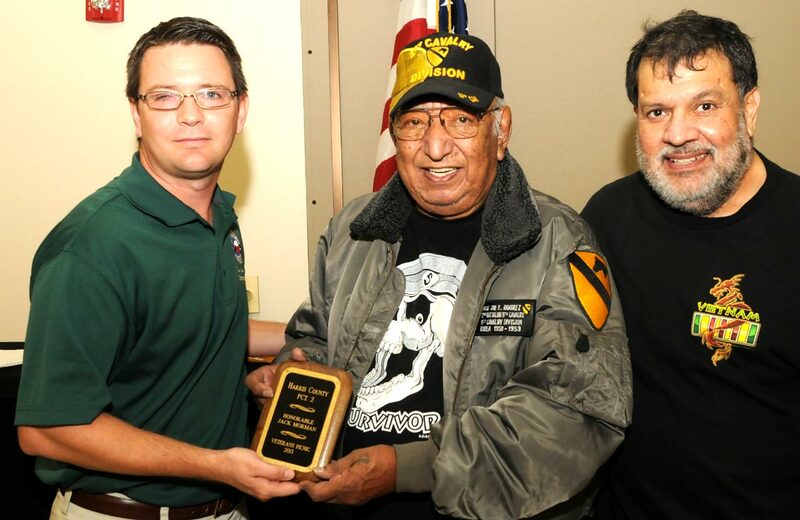 VETERANS FROM THE NORTH CHANNEL COMMUNITY are pictured at the Salute, receiving recognition and a back-pack of gifts as part of the North Channel Chamber event put on with the help of the North Shore and Galena Park Rotary Clubs, and major sponsors. Behind the veterans are the speakers for the day. 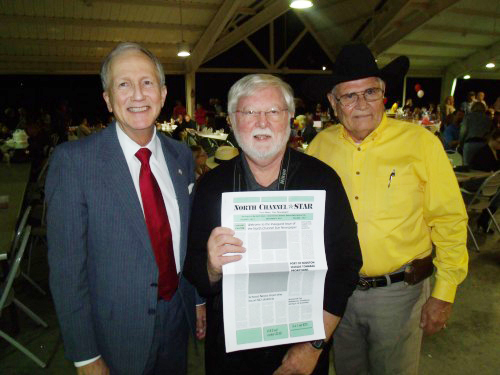 The North Channel Chamber of Commerce sponsored a “Salute to Our Community & Country” event on Thursday, November 7th at Armenta’s Banquet Hall on Sheldon Road in Channelview. This event was combined with a Rotary Club Salute, a health fair, and a Business Expo, and was well attended by hundreds of chamber members, businesses, and veterans. 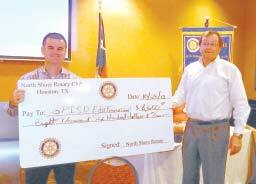 Rotarians from the North Shore and Galena Park clubs also attended, and held a brief meeting for their members. The Veterans Salute included presentation of the colors, gifts from the Rotary Clubs, and verbal recognition and salute to those attending that had been in military service. Health organizations that were present for screenings and information included Kindred Hospital, Houston Methodist San Jacinto Hospital, Dow Emergency Center, and East Houston Regional Medical Center. About 40 businesses had booths with displays of their products and services. The event lasted for about 4 hours, and was well received. SERVICE FLAGS were presented for each of the Armed Services by members of the Channelview ROTC. Veterans stand up as they are recognized by community. Two powerful high school football teams met last Friday night at Tully Stadium, and battled to a close score at the end. This was the Regional semifinals in Class 5A Division I Region III. The Cy-Fair Bobcats and the North Shore Mustangs came into the game with similar style of play — an overpowering defense, and a strong running game. North Shore was the favorite, ranked No. 4 and with a 12-0 record. They had only given up a total of nine points in their last four games. Cy-Fair entered with almost as good an 11-1 record. However, the Bobcats came up with the important plays when it counted most. In the first quarter, running back Dillon Birden ran 75 yards for a touchdown, thrilling the Cy- Fair fans, and setting the pace for the rest of the game. His total yardage was 216 yards on 29 carries. D. Tobler also carried for the Bobcats, with 5 carries for 29 yards. Cy-Fair was also able to mount a good passing game, with quarterback C. Kopecky having 9 completions on 13 passes, for a total of 185 yards. At the end of the first half, Cy-Fair led 6-0 on the strength of their long run in the first quarter. However, in the third quarter North Shore made a strong comeback, with a 10 play drive that went 70 yards and resulted in a TD when quarterback Lawrance McCardell threw a 15 yard screen pass to Kevian DeLeon, resulting in the Mustangs taking a 7-6 lead. McCardell completed 3 passes in the game on 10 attempts, for a gain of 30 yards. The Mustang lead did not last that long, however, The defensive battle continued through the rest of the second half, with the ball changing hands regularly. Three minutes into the fourth quarter, the Bobcats’s running back Dillon Birden struck again, with a 57 yard effort that helped set up a field goal attempt. With about 8 minutes left in the game, the Bobcat’s Braden Mann put his foot to an 18 yard field goal attempt that was good, and gave the Cy-Fair team a 9-7 lead which was the final score. Cy-Fair will go on to the next round of the play-offs, facing Pearland on December 7th. They will play at either Mercer Stadium or Rice Stadium. As an indication of how even the match was, each team had to punt 5 times, and was penalized almost the same yards. 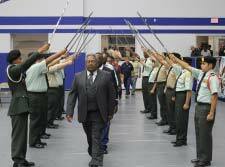 Local veterans take the “Walk of Honor” during Channelview ISD’s Veteran’s Day Celebration recently. Valor. Courage. Sacrifice. These three words describe efforts the men and women honored during the Channelview Independent School District’s Veterans Day program held recently at the Bill Neal Center. More than 200 people attended the community-wide event that was sponsored by the district and the Channelview High School Army ROTC and the Alice Johnson Junior High and Aguirre Junior High LOTC groups. The event began with local veterans entering the c arena with a Walk of Honor through crossed swords. CHS cadet Melissa Presa then read a poem about the meaning of Veterans Day, followed by the introduction of every military veteran in attendance at the ceremony. Retired Army Lt. Col. Victor Herbin was the keynote speaker at the ceremony. In his career, he served in many capacities at the U.S. Military Academy at West Point. He also served in various positions in the education field, including being an adjunct professor at St. Phillips College and Houston Community College. He is a former ROTC instructor at Channelview High School and he developed a Leadership Officer Training Corps curriculum for middle school students in San Antonio ISD. 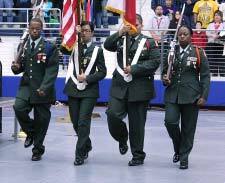 The Channelview High School Color Guard and Rifle Team march in during the presentation of colors. The bands and choirs from Aguirre, Alice Johnson and CHS all performed during the ceremony. The ceremony concluded with bagpipe player William Titus performing “Amazing Grace” and Autreiyas Watson from the CHS Band playing TAPS.